This Olive oil and extract shampoo act to repair the damaged hair. Olive oil helps stop hair fall especially due to dry hair. 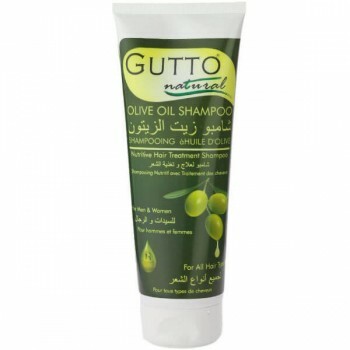 Gutto ultra-mild shampoo with olive oil is a natural shampoo that can also take care of your hair as a hair mask or a conditioner. It is a moisturizing and softening care that will grease and strengthen very dry hair, damaged or brittle hair and nourish hair whether curly, colored, curly or frizzy. It smoothes frizz and removes all traces of styling products. The benefits of olive oil are known since antiquity, this natural ingredient gives strength and shine to the hair. The recipe of this natural shampoo is a real invigorating for fine or fragile hair but also acts in detangling care allowing a simple brushing of hair, without risk of fall or breakage during disentangling. Dehydrated hair finds a natural remedy that, thanks to its vegetable oil, repairs split ends and will give any hair a glossy and silky appearance. Wet the hair and apply a few drops of olive oil shampoo in the palm of your hand. Spread on the head then, with the foam, massage the scalp and massage to the ends. Let stand a few minutes as a mask to let the ingredients act and then rinse thoroughly.